Jam & Chutney Making. Kettle separates from base for easy pouring. Tea & Coffee. Outer layer is comprised of highly durable, clear plastic to protect glass inner. Inner heat-resistant borosilicate glass layer. Bodum Bistro Electric Kettle Double Wall 1.1L / 37oz Off White Ref: 11445913UKThis Bodum Bistro Electric Kettle has an inner layer of heat-resistant borosilicate glass, with a protective outer layer of clear plastic. Bodum Bistro Electric Water Kettle, 1.1 Ltr, 1500 W White 11445-913UK. The outer wall is made from clear plastic; it protects the glass from shocks and makes it much less prone to breaking. 1 x Bistro Double Wall Water Kettle. Jam & Chutney Making. Pitcher can be secured to the base in any direction during use, and easily remove for cordless pouring. Easy to read water level indicator prevents the waste of water and energy. Boil water quickly in the Bodum 11452913 Bistro Electric Water Kettle! 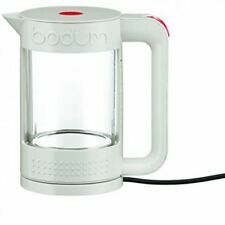 Bodum Bistro Electric Kettle Double Wall 1.0L / 34oz Off White. A 360° base will allow you to comfortably use the Bistro Electric Water Kettle whether you are right or left handed. Boil water quickly in the Bodum 1145201 Bistro Electric Water Kettle! A 360° base will allow you to comfortably use the Bistro Electric Water Kettle whether you are right or left handed. A large 1 litre capacity makes the 1145201 ideal for the whole family and great for coffee, tea and instant soup. Bodum Bistro Electric Water Kettle, White - 1.1 L/37 Oz. Condition is New. Dispatched with Royal Mail 2nd Class. 1 x Bodum Bistro Electric Water Kettle,1.0L, Black. Whether you're a tea lover or a coffee aficionado, the Bistro electric water kettles are the kitchen staple you can't do without. They're made from plastic, silicone and stainless steel. Whether you're a tea lover or a coffee aficionado, the Bistro electric water kettles are the kitchen staple you can't do without. They're made from plastic, silicone and stainless steel. Simple to use, an on/off button is built into the handle for a perfect grip. Description For a sleek and stylish kettle that provides you with the odd satisfaction of watching the water bubble away, this is the kettle of choice. This Bodum Bistro kettle features a transparent double-wall which boasts improved insulation meaning the water stays hot for a longer time. The inner wall is crafted from borosilicate glass, neutral material that is most suited keeping water pure. Sturdy and robust, the clear plastic outer layer of this kettle is very hardwearing and resistant to breaks, delivering excellent value for money. Features ---Efficient – With a double wall the water is well insulated, making this kettle very energy-efficient. ---Stylish – This sleek kettle will easily suit any contemporary kitchen décor. The outer wall is made from clear plastic; it protects the glass from shocks and makes it much less prone to breaking. Design Line Bistro. Materials/s plastic, borosilicate glass, silicone. Colour Black. Colourful, compact, space-saving design pairs perfectly with e-Bodum’s Bistro collection of kettles and coffeemakers. 1 x Bodum Bistro Electric Water Kettle,1.0L, White. See the water bubbling up in this double wall glass kettle and it’s crystal clear. Design Line BISTRO. Pitcher can be secured to the base in any direction during use, and easily remove for cordless pouring. Colour Off white. Width (cm) 20.0. Capacity 1.0 L. Manual On/Off switch plus steam sensor for automatic shut-off and added safety. The Bodum 11138-01UK Bistro Electric Water Kettle is a 1. Its tactile body is made from plastic, stainless steel and silicone 1. The outer wall is made from clear plastic it protects The glass from shocks and makes it much less prone to breaking. Double Wall Matching Bodum Bistro Toaster available Compact size Capacity 1. 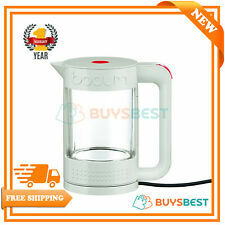 Bodum Bistro Electric Water Kettle (Off White) - 1L Free Shipping! Bistro Electric Water Kettle (Off White) - 1L. Colour Off White. Simple to use, an on/off button is built into the handle for a perfect grip. At The Nile, if you're looking for it, we've got it. We've got this. Bodum Bistro Electric Water Kettle (Black) - 500mL Free Shipping! Bistro Electric Water Kettle (Black) - 500mL. Size 500mL. Simple to use, an on/off button is built into the handle for a perfect grip. Colour Black. We've got this. Parent Product 0514886347505. TheNile_Item_ID:119631848;. With its powerful 1. A large 1 litre capacity makes The & 1145201 ideal for The whole family and great for coffee tea and instant soup. A 360 d base will allow you to comfortably use The & Bistro Electric Water Kettle whether you are right or left handed. With its powerful 1. A large 1 litre capacity makes The & 11452913 ideal for The whole family and great for coffee tea and instant soup. A 360 d base will allow you to comfortably use The Bistro Electric Water Kettle whether you are right or left handed. This is what remains of a Ettore kettle. Still in perfect working order. This kettle is now no longer manufactured so get it whilst you can in this gorgeous orange shade (or mix and match!). Bodum Zaparzacz do herbaty bodum Bistro Set K1875-01 (kolor transparentny)K1875-01 / AGDBODEDH0003. Orientacyjna waga brutto opak. zbior. : 760 g.
Model No: 11445913UK. Max/Min water level indicator. On/Off indicator light. Inner wall made from borosilicate glass. Water level gauge. Marke BODUM. 5 temperature settings: 60 ° C, 70 ° C, 80 ° C, 90 ° C and 100 ° C. Temperature adjustable via rotary switch variable. ONE & ONLY. 30-minutes keep warm function. The inner wall is crafted from borosilicate glass, neutral material that is most suited keeping water pure. Stylish – This sleek kettle will easily suit any contemporary kitchen décor. Efficient – With a double wall the water is well insulated, making this kettle very energy-efficient. The inner wall is crafted from borosilicate glass, neutral material that is most suited keeping water pure. Efficient – With a double wall the water is well insulated, making this kettle very energy-efficient. The outer wall is made from clear plastic; it protects the glass from shocks and makes it much less prone to breaking. 1 x Bistro Double Wall Water Kettle. 1.1 Litre Water Capacity. Cordless Kettle. Electric Kettle. The outer wall is made from clear plastic; it protects the glass from shocks and makes it much less prone to breaking. Box Contains 1 x Bistro Double Wall Water Kettle. See the water bubbling up in this double wall glass kettle and it's crystal clear. Whether you're a tea lover or a coffee aficionado, the Bistro electric water kettles are the kitchen staple you can't do without. They're made from plastic, silicone and stainless steel. Simple to use, an on/off button is built into the handle for a perfect grip.1 Bistro Electric Water Kettle. The outer wall is made from clear plastic; it protects the glass from shocks and makes it much less prone to breaking. 1 x Bistro Double Wall Water Kettle. 1.1 Litre Water Capacity. The most energy efficient way to boil water is to boil only the amount that is needed for your use. This cordless is perfect for boiling any amount. It has a 37 oz. fill capacity with a see through, easy to read water level indicator. The outer wall is made from clear plastic; it protects the glass from shocks and makes it much less prone to breaking. 1 x Bistro Double Wall Water Kettle. See the water bubbling up in this double wall glass kettle and it's crystal clear. Electric kettle: features a manual on/off switch and power indicator light, plus a steam sensor for automatic shut off and added safety; BPA free plastic. This water kettle can be set and held at desired temperature for up to 30 Min! Bodum - 11451-913 Bistro Electric Kettle - 0.5 L - White. Size5 Liter | Color:Black Whether you're a tea lover or a Coffee aficionado – the Bodum Bistro electric water kettles are the kitchen staple you can't do without. Simple to use, an on/off button is built into the handle for a perfect grip. Size5 Liter | Color:White Whether you're a tea lover or a Coffee aficionado – the Bodum Bistro electric water kettles are the kitchen staple you can't do without. Simple to use, an on/off button is built into the handle for a perfect grip. Whether you're a tea lover or a Coffee aficionado – the Bodum Bistro electric water kettles are the kitchen staple you can't do without. Simple to use, an on/off button is built into the handle for a perfect grip.